In search of a new compact saw? 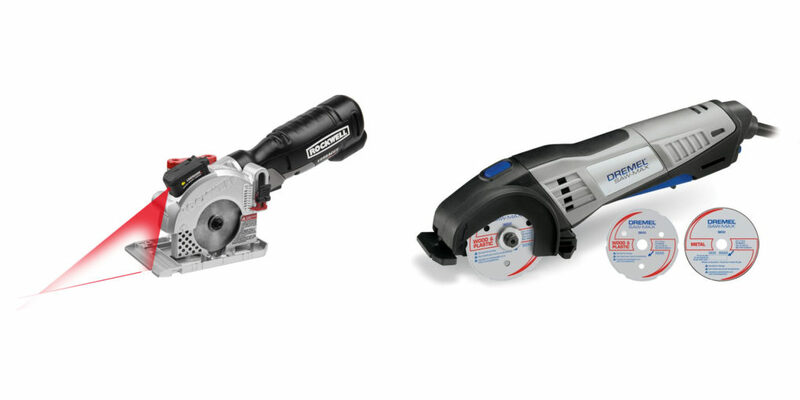 We compare the Rockwell Versacut vs Dremel Saw Max against one another. Before we make that comparison lets first have a brief look at each compact saw and see what they have to offer.​ Below we have a review of each and then a final comparison at the end. ​The Rockwell RK3440K Versacut is a 4 Amp compact circular saw that is designed for ease of use when using only one hand. The Versacut has a 3-3/8 inch blade that gives it a max cutting depth of 1-1/16 of an inch. This means you can actually cut a standard sheet of 2 inch thick material providing of course you flip it over and make another cut from the other side. The bevel angle on the RK3440K is fixed at 90 degrees so all cuts can only be made at that angle. The Versacut has a rear mounted motor and metal shoe. This results in a very well balanced tool that is perfect for one handed operation on light cutting jobs. It comes with a built in laser​ guide helping to improve the accuracy of your cuts especially longer rip cut on large sheets. The Dremel Saw Max is a 6 Amp hand held circular saw that has a blade size of 3 inches.It has two blades that come as standard, one for plastic/wood and another blade that is used for cutting metal. It's 6 Amp motor has a maximum no-load speed of 17,000 RPM. With a cutting ​depth of only 3/4 of an inch it is not capable of cutting. One of its main strengths is the versatility of the cutting that you can do with it. Flush, plunge and straight cuts are all possible. The blades can cut wood, metal, tile and some plastics. There is also added variable depth control that enables you to preset the depth of cut up to 3/4 of an inch. ​What are the differences between the Rockwell Versacut and the Dremel Saw Max? The main pain point with the Saw Max is that it has a very small cutting depth of 3/4 inch against the Versacut's ​1-1/16 of an inch. If you are trying to cut through 2 inch sheet then the Saw Max quite imply will not cut it. ​That is why for us the Versacut is the clear winner versus the Dremel Saw Max.